Canadian Zachary Claman De Melo isn't apprehensive about qualifying 13th for this weekend's Indianapolis 500. After all, 13 has been a meaningful number for the 20-year-old Montreal native, who'll be making his Indy 500 debut Sunday. His late grandmother was released from a Nazi concentration camp on a Friday the 13th and the camp tattoo numbers on her arm all added up to 13. He also claims on his website 13 is his lucky number. "I pick and choose my moments (about being superstitious)," Claman De Melo said via telephone Thursday. "For the qualifying draw I didn't want to go first, so I wouldn't let anyone draw for me because if I did I was definitely going to go first. "And then I ended up picking myself first. I don't believe it's a coincidence I'm 13th but it does mean something to me and so hopefully it turns into something special." Claman De Melo will start Sunday's race on the fifth row with Ryan Hunter-Reay and Charlie Kimball. Robert Wickens — the other Canadian in the field — will open on the sixth row with Takuma Sato and Kyle Kaiser. James Hinchcliffe, the veteran Canadian IndyCar driver, did not qualify. 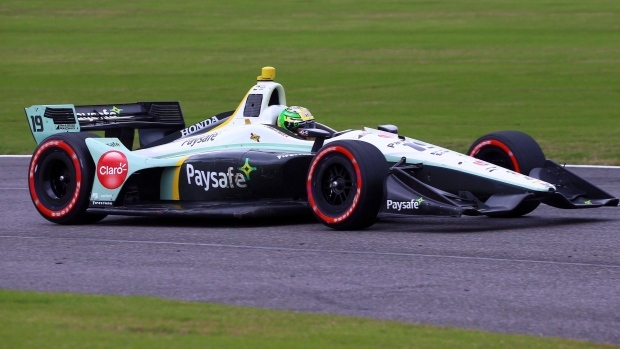 Claman De Melo will drive at Indianapolis Motor Speedway for Dale Coyne Racing as Brazilian Pietro Fittipaldi's replacement. The grandson of former Formula 1 star Emerson Fittipaldi suffered serious injuries in a crash earlier this month. Despite entering the race unconventionally, Claman De Melo isn't content with just being there. "I'm a pretty competitive person and that's not how I look at it," he said. "After our qualifying result and seeing what we can do in traffic ... I'm going for a win here. "I believe I can win this thing." Wickens, 28, of Guelph, Ont., is eighth in this year's IndyCar driver's standings with 133 points. He'll also be making his Indy 500 debut with Schmidt Peterson Motorsports but earned the pole in March at the Firestone Grand Prix of St. Petersburg before finishing 18th. Wickens crashed during practice Monday but said his car will be ready to go Sunday. "If it was a slightly longer practice session Monday, we actually probably would've gone back out before the day was done," Wickens said. "We decided as a team it's best to take our time and make sure everything perfect to the millimetre just to make sure we have a great race car Sunday." Wickens has two championship titles under his belt (2006 Formula BMW USA, 2011 Formula Renault 3.5). He most recently completed a six-year run in DTM, earning six wins, 15 podium finishes and five pole positions. But driving in the Indy 500 has been a longtime dream. "It's been a childhood bucket list thing to do and just to have the opportunity is such a privilege," he said. "The fact I'm on the grid, 33 drivers in the world get to start the 102nd running of the Indianapolis 500, it's pretty cool." Claman De Melo began driving in 2008, competing in regional and national karting events. In 2010 at age 12 he clinched the first of three Canadian kart titles and at 16 was third at the world kart championship. In 2015, he made the jump to open-wheel racing in Europe's Formula 3 MSV Cup before landing with defending Indy Lights champion Juncos Racing in 2016. The following year, he raced for Carlin Motorsport. Claman De Melo earned his first series win and posted four podium finishes to secure fifth in the driver's standings. Following the Indy Lights campaign, Claman De Melo made his Verizon IndyCar Series debut in the season-ending GoPro Grand Prix of Sonoma. He finished 17th in the 22-car field for Rahal Letterman Lanigan Racing. Claman De Melo credits family for his progress. "I get my aggressive side on the track from my dad, Carlos, and it's because of him I got into racing," Claman De Melo said. "Everyone knows racing is an expensive sport and my mom (Catherine) spent almost everything she has on me and always believed in me even when no one else did and thought I was talented even at those times when I doubted myself. "Being kind of the sports kid in the family I got a lot of the attention ... and for my sister (Zoe) to always be super supportive and never jealous of what I did was also great. I struggled with school when I was younger and needed a lot of tutoring with all the travelling and racing I did and she always helped me with school. My whole family has always been so supportive, I can't thank them enough." Despite the gap in their ages, Wickens said he's familiar with Claman De Melo. "I'd say we know each other pretty well," he said. "He's a good kid, he's level-headed. "Honestly I think he's trying maybe to find his identity a little bit and make a name for himself. But I think the big thing for him is not to force and let it happen naturally." On Sunday, Wickens plans to practise what he preaches. "On the 80th lap, which is already kind of a pretty long race, you don't need to risk everything because you're not even halfway at that point," he said. "The whole key is trying to keep your car alive and in good spirits for the last 50 miles. "That's going to be what wins you the race. Leading for the first 200 miles isn't going to do anything." Claman De Melo grew up watching Formula 1 and dreamed of racing one day on that circuit. "I wouldn't necessarily say that's changed but IndyCar is just as competitive," he said. "IndyCar is really strong, it's the top level of racing and considered on par with Formula 1 in my opinion. "So to be here, to be there, wherever I'm racing and I can make a living and make my life doing something I love every day is pretty special." Claman De Melo said he's an aggressive driver by nature, but patience and timing will be key Sunday. "I'll still be my aggressive self but you can't force anything here more than most places," he said. "If there's a hole and you're not sure about it, you don't take it. "I think it's all about picking and choosing your moments at this place." Traditionally, the Indy 500 winner celebrates by drinking milk. Claman De Melo said he usually only has milk with cereal but would gladly make an exception Sunday. "I'll chug that whole jug of milk if I have to," he said with a chuckle. Wickens doesn't anticipate nerves being an issue for him. "I've always been a very strong believer that you can't expect anything in life and expectation is the first step to failure," he said. "I'm honestly going into this race without any expectations. "I've been doing that all season long and so far it's been working pretty well."